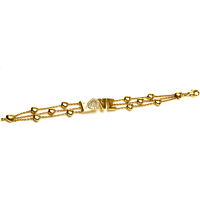 From Chopard’s popular Happy Diamonds collection, this delightful gold heart bracelet is finely crafted in 18kt yellow gold. 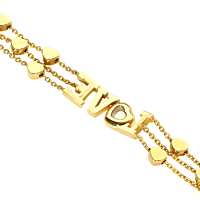 The bracelet's triple strands are adorned with tiny solid gold polished hearts, with solid gold "love" letters in the center. A sparkling letter O, in the shape of a heart, is adorned with 15 round brilliant cut diamonds.